What is the 'screen door effect'? The screen door effect is an artefact produced by all digital projectors. While CRT projectors produce their image by scanning lines, just like a conventional TV but bigger, digital projectors work differently. LCD projectors shine the light through three bit-mapped panels, each of which consists of hundreds of thousands of individually controllable pixels. DLPs bounce the light off hundreds of thousands of microscopic mirrors -- once again, each representing a pixel. In both cases the panels are backed by some tricky electronics which map the incoming scan lines onto the pixels, scaling the signal to the right resolution where necessary. The problem is that each pixel has some control electronics around it. If your projector's lens is sharply focused, each individual pixel appears on the screen in its own little black box. The lines of the boxes are where the control electronics stops the light from shining through the panel (or is non-reflective at the edges of a DLP micro-mirror). It's somewhat like looking at the scenery through a fly screen, thus the name. To reduce this there are several options. First, DLP projectors suffer from this effect less than LCDs because, due to the nature of the panel design, the control circuitry isn't as large. More of the chip's surface is used to transmit light. Another option is to reduce the size of the individual pixels by using a higher resolution projector. Get those black lines small enough and you won't be able to see them. But let's say you already have a projector, what can you do? De-focus. It's anathema to many a projector owner to make the image less sharp than the projector is capable of producing. But for many people it can produce an improved picture. Let's try it. Get ready to experiment, limber up the fingers and relax. You're going to need steady hands for this procedure because you need to find a very tight sweet spot. The lens has to be de-focused enough to blur the black lines between the pixels, but not so much as to cause the pixels to overlap. 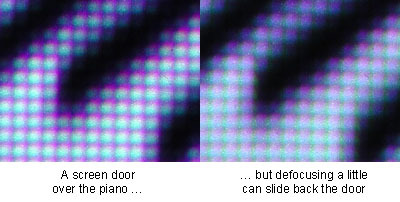 The figure shows an actual close-up photo of the screen door effect of a sharply focused projector, and then the same frame but with the projector slightly defocused to reduce the screen door effect. You will notice that the black lines aren't gone, merely softened. But this can be enough to largely remove the screen door effect. Watch a few movies with the projector set like this before you decide. Somewhat counter-intuitively, removing the screen door effect can make for a more tiring view. How can this be? When you watch a fairly low resolution image (eg. a PAL DVD on a large display), the result is not generally blockiness or pixelisation, but fuzziness. Watching a fuzzy image can be tiring to the eyes as they constantly try to sharpen the focus. The screen door, even though it reduces the smoothness of the image, can give the eye something sharp to focus on and thus actually allow a more relaxed viewing experience.